Crucial to the survival of a glacier is its mass balance, the difference between accumulation and ablation (melting and sublimation). Climate change may cause variations in both temperature and snowfall, causing changes in mass balance. Changes in mass balance control a glacier’s long term behavior. It is the most sensitive climate indicator on a glacier. A glacier with a sustained negative balance is out of equilibrium and will retreat. A glacier with a sustained positive balance is out of equilibrium and will advance. It is important to examine the mass balance of glaciers to identify whether the glaciers have a future. The focus here will be on North American glaciers. Mass balance measurements in Western North America from 1984-2005 indicate a declining trend in glacier mass balance. The trend indicates all of the glaciers are out of balance and that some will disappear. The question is determining which glaciers are merely out of equilibrium and can retreat to a position of equilibrium, and which are in disequilibrium and will melt away? Let me explain. Glaciers have long been observed as sensitive and reliable indicators of climate and to have a maximum climate change signaling effect. This together with their wide distribution has made them a key marker of climate change used by the IPCC. The World Glacier Monitoring Service (WGMS) collects annual mass balance data from alpine glaciers around the world. Mass balance is the key glacier variable documenting annual climate. Mass balance is the difference between annual accumulation and annual ablation (from melting and sublimation). A glacier is divided into an ablation zone where all accumulated snow is lost from the winter and an accumulation zone where snowpack is retained to the end of the summer. The alpine glaciers discussed here are not calving, nor do they have superimposed ice, two factors that complicate measurement. For an alpine glacier to have an equilibrium balance it typically must have upwards of 60% of its area in the accumulation zone at the end of the summer melt season. Glaciers respond to climate change in an attempt to achieve a new equilibrium. A glacier advances due to a climate cooling/snowfall increase that causes positive mass balance. The advance increases the glaciers area at low elevation where ablation is highest, returning the glacier to equilibrium. A climate warming/snowfall decrease leads to negative mass balances and glacier retreat. An equilibrium response occurs when a new equilibrium is reached by a retreating glacier losing enough of its high ablating sections, usually at its lowest elevations, so that accumulation once again balances ablation. This is a glacier equivalent to jettisoning bad debt. If a glacier cannot retreat to a point where equilibrium is established, it is in disequilibrium with the current climate. A glacier that is in disequilibrium will melt away with a continuation of the current climate. Consistent annual mass balance measurements over at least a 20 year period are available on 16 glaciers in North America. These records are submitted to the WGMS. The annual balance and cumulative balance records of these glaciers illustrate the adjustment of these glaciers to climate change from 1984-2005 . The annual balance record, in meters of water equivalent, 1984-2005 indicates that despite continued significant retreat of all 16 glaciers, mass balances are declining. The mean annual mass balance has declined from -0.35 m/a 1984-1990, to -0.59 m/a in 1991-1997, to -0.91 m/a from 1998-2005. Instead of approaching equilibrium after several decades of dominantly negative annual balance, and significant retreat, mass balance is becoming more negative. This indicates the glaciers are getting further away from equilibrium, not approaching it. The consistency of the cumulative balance trends further indicates the glaciers mass balance record is dominated by large scale regional to global climate change. CRYSYS (CRYospheric SYStem in Canada) mass balance program (M. Demuth) monitors the Place and Helm Glacier in the British Columbia, Coast Range north of Vancouver. The USGS benchmark program monitors South Cascade Glacier, North Cascades, WA (R. Krimmel), Wolverine Glacier, Kenai Mountains, AK and Gulkana Glacier, Alaska Range, AK (R. March). The Juneau Icefield Research Program monitors the mass balance of Lemon Creek Glacier, Coast Range, AK (M. Miller and M. Pelto). The North Cascade Glacier Climate Project monitors the mass balance of Columbia, Daniels, Easton, Foss, Ice Worm, Lower Curtis, Lynch, Rainbow, Sholes, and Yawning Glacier, North Cascades, WA (M. Pelto). Figure 2. The annual mass balance signal is remarkably coherent from glacier to glacier. It is important to note whether glaciers are undergoing an equilibrium or disequilibrium response to climate change. If the annual equilibrium line, that is the elevation where snowpack remains at the end of the summer, rises above the mountain top this will lead to glacier loss. The equilibrium line is the elevation on a glacier at which annual accumulation equals ablation. This is not the only means to an end for a glacier, nor is it a robust means for identifying glacier disequilibrium. A glacier that is approaching equilibrium during retreat will thin mostly near the terminus, and at some elevation above the terminus, usually near the equilibrium line or in the lower accumulation zone, there will be comparatively little thinning (Schwitter and Raymond, 1993). This indicates that at least a portion of the glacier is healthy. A glacier that is not approaching equilibrium will thin appreciably along the entire length of the glacier (Pelto, 2006). There are two means to identify glacier disequilibrium. The first is substantial thinning along entire longitudinal profile of the glacier. The second symptom of a glacier in disequilibrium is frequent years with no accumulation area. That is the equilibrium line is above the glacier. Which glaciers are experiencing an equilibrium response? Glacier thinning in the accumulation zone is limited on Lemon Creek (Miller and Pelto, 1999), Gulkana and Wolverine (Sapiano, et. al, 1998), and Easton, Lynch and Rainbow Glacier (Pelto, 2006). Each appears able to retreat to a new point of equilibrium with the current climate. On Columbia, Daniels, Foss, Ice Worm, Lower Curtis, Sholes, and Yawning Glacier thinning is not notably less in the accumulation zone than the ablation zone, indicating disequilibrium (Pelto, 2006). Two North Cascade glaciers where mass balance measurements were conducted the Spider and the Lewis Glacier disappeared during this interval (Pelto, 2006). On Helm and Place Glacier the loss of more than 20% of their entire volume, since 1984 suggest they too are in disequilibrium. South Cascade Glacier has lost 70% of its volume since 1890 (Josberger et al., 2006), and is still experiencing large negative balances indicating disequilibrium. In Glacier National Park, North Cascades, Helm Glacier and Place Glacier frequent loss of the entire snowcover by the end of the ablation season has become commonplace (WGMS, 2005 The result is in net ablation throughout the accumulation area causing thinning of the glacier in the accumulation zone. Are the glaciers responding primarily to climate changes of the last 30 years, or to the post Little Ice Age conditions? In the North Cascades Rainbow, Yawning, Easton and Lower Curtis Glacier all advanced during the 1950-1975. Sholes, Columbia, Ice Worm, did not advance or retreat significantly during this period. Thus, each of these glaciers is definitively responding to the climate of the last 30 years. 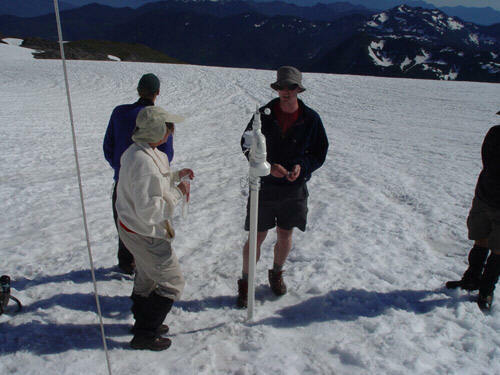 In the North Cascades the warmer temperatures have increased summer ablation on the glaciers (Pelto, 2006). The glaciers are losing mass not just because of increased summer melting. In the winter despite a small increase in precipitation, retained snowpack at the end of the winter has declined. The reduced accumulation is due to rain and melt events in the winter. On Lemon Creek Glacier it has been noted that fewer ice lenses are forming (Miller and Pelto, 1999). This is an indication that the spring snowpack is not cold enough to lead to substantial refreezing of meltwater. This is important information regarding the 1998 mass balance, because 7-11% of the retained annual accumulation is typically in ice lenses. Failure to retain this meltwater increases net ablation. The reason for the change is warmer snowpack winter temperatures, +4oC above the long term mean at the Juneau Airport seven miles from the glacier at sea level in 1997 and 1998. The result of the failure to recapture meltwater as internal accumulation is increased ablation and negative annual balances (Kaser and Osmaston, 2002).